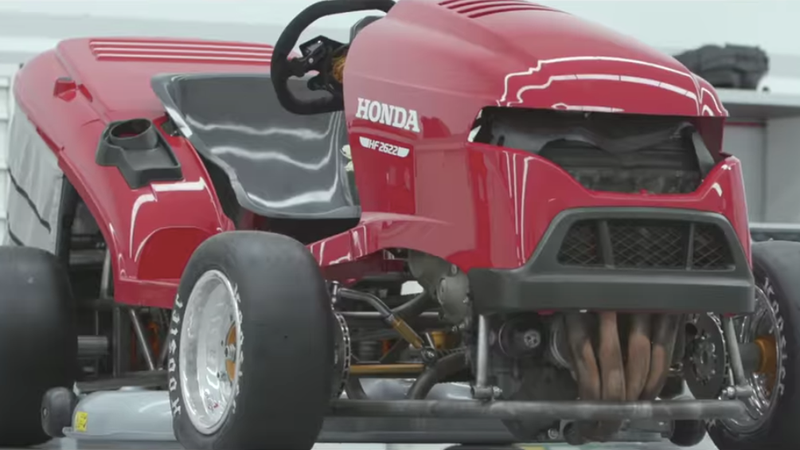 Nearly four years ago, Honda’s Mean Mower went an averaged 116.57 mph, setting the record for world’s fastest lawnmower that has since been eclipsed. Now, the company says, they’re trying to reclaim the record, with a beast they’ve dubbed the Mk. 2. The Mk. 2 is powered by a 1,000 cc four-cylinder that makes a claimed 189 horsepower and 84 lb-ft of torque. Honda calls the engine Fireblade, and normally uses it to power its CBR1000RR superbike. It’s got six gears with a long first ratio. In fact, the mower should be good for about 90mph in first. Sub 3.0sec 0-60mph? It’s probably not going to be far off. The other gears are packed tighter together, with the advantage being a small rev window between each cog so the load through the chassis shouldn’t be as great. That chassis might look like ordinary steel to the uneducated amongst us, but it’s actually T45. The stuff that they made the Spitfire chassis out of. The reason Team Dynamics have chosen this stuff, and not something like chromoly (favoured by rally raid types on account of it being as indestructible as cockroaches), is because T45 flexes more. Remember, Mean Mower II has no suspension. So the chassis needs flex as well as strength. Fun fact – the rear tyres are exactly the same size as the front tyres of the Tyrrel P34, the achingly cool six-wheeled F1 car. Not so fun fact but still important – the Hoosier tyres are incredibly sticky. To me, though, the only important question is: Can this thing actually mow grass at speeds of over 100 mph? The original Mean Mower couldn’t, even though it could mow grass at slower speeds. Honda says the Mk. 2, in fact, can, a test which I would like to see right after they break the speed record. The current record is 133.57 mph, set in November 2015 by a Norwegian company who used a modified Viking T6. Honda says they’re shooting for at least 134 mph. The company didn’t announce when they would be making their record-attempt, but they did announce a driver, Jess Hawkins, a stunt driver and former British karting champion. Wishing you well, Jess.